Buying a chainsaw can be an overwhelming task for anyone but there are a lot of things to consider when buying a chainsaw that will make the purchase easier. Chainsaws come in a range of different sizes, with different features, different functions and different types. We are here to help you make better-informed decisions in relation to getting a chainsaw. 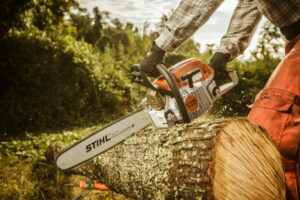 Here are 3 variables to consider when buying the perfect chainsaw. What will you primarily be using it for? Is it a big job or small job in my garden or is it some professional work? The nature of the work you will be doing should have a major impact on the chainsaw you pick. The job requirements and specification should be able to be catered for by the chainsaws abilities and features. What is your experience using a chainsaw? Are you comfortable holding a chainsaw? There are lots of different types of chainsaws with different features. Some chainsaws are easier to control than others so this should be taken into account also. What type of wood will you be cutting with this chainsaw? Softwood or hardwood? Big trees or small trees? If you are cutting big thick trees or pieces of wood then a more powerful chainsaw with sharper teeth would be suitable. There are four types of chainsaws to choose from. Different types of chainsaws are optimal in different environments and have different features. Features are what make products unique. Every product is manufactured with different features so it is about deciding what ones you want and would like your chainsaw to have? Safety features- Some chainsaws have special safety features incorporated into them to prevent accidents from occurring. For example kickback guards, chain brakes, throttle locks, easily accessible stop control and many more. Anti-vibration system to make it easier to control and reduce user fatigue. Reduced noise feature so it isn’t very loud and endangers the users hearing. Reduced emission technology to be environmentally responsible. Large handles making it easy to grip. Replaceable “In Tank” Fuel and Oil Filters lower cost and are easy to maintain. 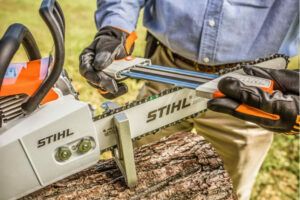 Here are some of the features that different Stihl chainsaws have but there are many more. When trying to choose the right chainsaw for your work, it is important to consider these three important variables and know in the detail the tasks you will be carrying out. For more information on chainsaws call us on 021-496-5132 or visit us online today. Impressive power drive – Petrol chainsaws have a two-cycle engine which fires on every revolution of the crankshaft making them more powerful engines than electric motors. They have longer/sharper blades which allow a petrol chainsaw to take on thick branches, plants and trees easily. Electric chainsaws cannot take on thick/tough objects. Petrol chainsaws do not need to be plugged into a power source or charged up and do not have electrical cords in their path, unlike electric chainsaws. It is easy to move from one place to another and anywhere in your garden to do your cutting. This makes petrol chainsaws much easier to use than electric chainsaws when completing tasks as they crop up. They are powerful enough to take on any cutting job that is found in a household and beyond. Average households will not have branches or trees that cannot be taken care of with a petrol chainsaw, and a set of branches or bushes can be easily landscaped by a petrol chainsaw. Speed – Petrol chainsaws cut through wood, logs, branches and other objects you might need cutting, faster than electric chainsaws. The faster you can complete a cutting task the faster you can go on to the next or the quicker you can be finished your task completely. More work completed faster means saving more time and in lots of cases more money which is a huge incentive why people prefer petrol chainsaws over electric chainsaws. STIHL petrol chainsaws are essential for heavy duty and forestry work. These chainsaws are specially developed for extreme conditions and difficult cutting situations and offer everything that professionals require for cutting. A selection of model ranges are available;- domestic/property chainsaws, agricultural/landscaper chainsaws and professional/forestry chainsaws. The main motive behind the creation of chainsaws was the difficulty in cutting thick objects and felling trees with a hand saw. Hand saws used to be the only way one could cut objects so with time has come great inventions bringing the powerful petrol chainsaw making it so easy to cut objects. They have significantly reduced the effort and workload. Choosing between an electric chainsaw and a petrol chainsaw does not need to be a complicated process. One needs to consider certain factors in the buying process of a chainsaw such as the work and tasks involved, demands, preferences, budget, storage and one’s own chainsaw skills and experience. If you have any questions relating to petrol chainsaws call us on 021-496-5132 or visit us online today. An electric chainsaw is a chainsaw that doesn’t require liquid fuels to work. A chainsaw is a vital cutting tool that all homeowners should have. There are two main types of chainsaws electric and petrol. A question that is frequently asked is which is better electric or petrol chainsaws? Electric chainsaws are perfect for homeowners who like to take care of all of their gardening needs themselves. They provide enough power to manage light-to-medium cutting jobs around the garden. Electric chainsaws are ideal for pruning, felling small trees and even cutting up logs for the fire. They are much quieter while in operation – avoiding noise levels and complaints from neighbours. This also means that no ear protection is necessary when in use. They are user-friendly and reliable. An electric chainsaw has no exhaust and emits no fumes meaning you won’t have to inhale them whilst in operation. This also makes means they are safer for the environment. They require very little maintenance and far less upkeep in comparison to petrol chainsaws. They are much more inexpensive as they require less expensive components, less maintenance, and you don’t need to go out and buy fuel at a petrol station. Electric chainsaws are compact and lightweight. Our electric chainsaws are extremely comfortable to use and have ergonomic designs. Simple to start and operate- Just plug into an available power source, check the chain and press the ‘ON’ button. Electric chainsaws last a long time without use in comparison to petrol chainsaws as there are no issues with fuel going bad. They are extremely portable – due to being lightweight and generally much smaller than their petrol counterparts. 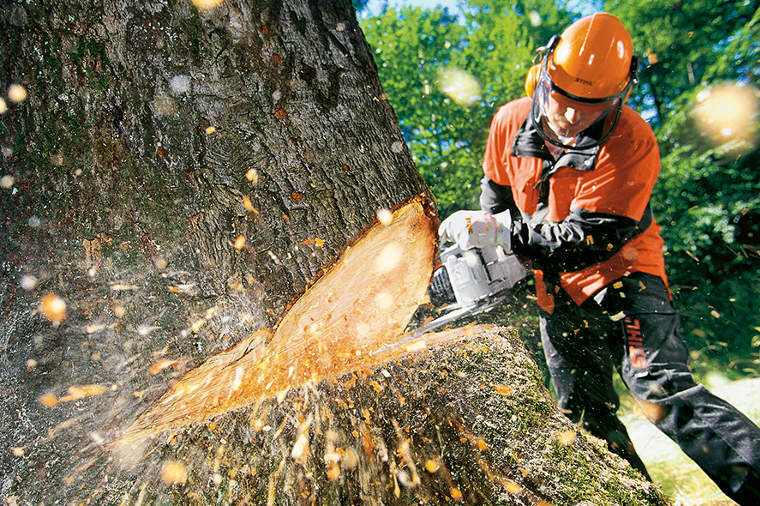 STIHL battery powered chainsaws meet the demanding requirements placed on performance, innovation and convenience. The Stihl MSA 160 T Chainsaw 12″ is a high cutting performance machine that is very quiet and has a soft grip handle. The Stihl MSA 160 C-BQ Chainsaw 12″ is perfect for property maintenance, horticulture, cutting wood for the fire and sawing work in enclosed areas. The Stihl MSA200 C-BQ Chainsaw 14″ has high torque and excellent cutting capacity which is great for dealing with a range of tasks. This chainsaw is perfect to use in noise sensitive areas due to its quiet EC motor. The electric chainsaw is a great innovation that has become synonymous with homeowners who are passionate about keeping their garden looking its best. Electric Chainsaws are one of those necessities for garden landscaping and home upkeep. They are ideal for a variety of tasks, but they aren’t for everyone and aren’t suitable for every job. When deciding whether or not you want to invest in this type of chainsaw consider your budget and your cutting needs. If you have any questions relating to electric chainsaws call us on 021-496-5132 or visit us online today to see our full range of chainsaws.